Personal Care Services are defined as those services that provide assistance with the activities of daily living. Activities of daily living (ADL) are personal, functional activities required by an individual an individual for continues well-being, health, and safety. 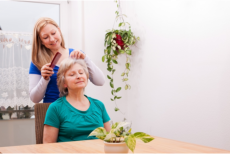 Personal Care Services will be completed by staff members possessing ‘Assisted Living Caregiver’ certification. Bathing and showering: Verbal prompt to participate in bathing activities; preparation of the bathing/showering area; management of water temperature; assistance in and out of the bath/shower; reaching head and difficult to reach body parts; rinsing, drying and exiting bath/shower area. Grooming: Verbal prompt to participate in grooming activities; assistance in shaving; brushing or combing hair; oral hygiene; application of deodorants and/or lotions or creams; and fingernail/toenail maintenance. Dressing: Verbal prompt to participate in dressing activities; putting on /taking off clothing; fastening/unfastening garments and undergarments; removal of assistive devices such as leg braces, compression garments, and artificial limbs. Bowel, Bladder, and Menstrual Care: Verbal prompt to participate in bowel, bladder, and menstrual care activities; assisting the Resident on/off the toilet; wiping and cleansing the body after toileting; assisting with using/emptying ostomy and /or catheter receptacles; application of diapers and disposable barriers pads. Menstrual care assistance is limited to external application of sanitary devices and cleaning. Feeding and Hydration: Verbal prompt to participate in feeding and hydration activities; cutting and arranging food for ease of ingestion; grasping utensil and cup; getting food on utensil; bringing food, utensil, cup to mouth; cleaning face and mouth as necessary during/following meal.